We review which metal shed would best suit you and your garden's needs in this detailed guide, including the benefits, types, brands and commonly asked metal shed questions. Metal sheds may not be the most glamorous subject but they have certainly gained in popularity over the last 30 years. Back in the 1990s, every garden had a shed, and it was made of wood, but now high quality metal sheds threaten their dominance. Wooden sheds, by their very nature, are bulky items. Most wooden sheds in the UK were traditionally delivered by local companies to individual homes where they were installed on site. This would typically involve a small lorry or flatbed truck and at least two or three installers. Depending on the shed size this would take at least an hour, and often longer. Factor in travel time and fuel costs and you can see it was relatively inefficient and costly to all parties. Wernick Buildings, based in Brownhills, Walsall, were one of the first companies to build their sheds on site in complete panels so the end user could construct them at home using long coach bolts. This removed the need for installers but still, the shed panels had to be delivered by at least two people, as they were very heavy and there had to be good access all the way to the proposed site. Things were different in America, with its vast distances and centralized shopping malls. Their massive steel mills were rolling and producing good quality steel at affordable prices. All that was needed was to design a metal shed that could be packed into a box or two and then shipped across America's highways to the malls where the new sheds could be collected or delivered locally by one man. It was only time before these manufacturers put their sheds into containers and shipped them all over the world, including the UK. Bernhard Schreiber was one of the very first to import metal sheds into the UK. He started several companies and at least three of them are still active in the UK shed market today. Bernhard had the vision and took the opportunity, but what was so great about this alternative product? The basic material used for the construction of any modern metal shed is galvanized steel. Developed during the industrial revolution, this is steel with a covering of zinc and your metal shed will have gone through a number of further processes with different layers and coatings applied that provide excellent protection against corrosion and rust. Hence there is no need for rust proofing or paint and, unlike a wooden shed, no more creosote or preservatives to prevent rot. Don't you have better things to do than treating your wooden shed every year? Modern metal sheds do not blister, crack or warp and demand virtually zero maintenance, they are watertight without the need to constantly replace roofing felt, rodent resistant and fireproof so you can safely store combustibles away from the house knowing that you are not likely to wake up watching Towering Inferno out of your back door window. A padlock will add security, so as they say, what is there not to like? In reality, nothing is ever that cut and dried and there is a darker side to metal sheds that needs to be understood so you get a balanced picture of what they offer so I'm not going to skirt around the edge but take look at the other side of the coin too. You will need an electric screwdriver as there are hundreds of screws that need to be fixed during construction. You will also need plenty of time and, depending on the size, you may also need a second pair of hands to assist. The door construction is probably the most difficult area but often this can be carried out before the main body of the shed in a garage where you can lay the parts out more easily. Building a metal shed is like a giant Meccano, some will love the challenge and the engineering others will see a pile of nuts and bolts and pieces of metal that all look the same. It should also be said that the panels used to clad the shed can appear flimsy. But fear not, as your shed will get its inherent strength when it is all bolted together, and not before. You have to remember you haven't bought a freight container but a light clad domestic shed. Let's start with the prepared base. Many metal sheds do not come with a floor as they are bolted to the ground so you need to make sure you have a level base. This would normally be flagstones, or concrete but not tarmac which can get very hot in the summer allowing the anchoring bolts to pull loose. Getting this base level is key to a stress-free installation as uneven bases throw the shed out of true alignment so it seems that the holes in the last few panels are drilled incorrectly when in fact the base is the real culprit. It is also worth adding a Damp Proof Membrane under your base to minimise any risk of condensation, particularly when the shed is newly constructed. If you want to put electrics or water into the shed, or a base anchor for fixing a motorbike or scooter, this is best fed in through the floor so will need to be considered at this early stage as you cannot drill through a metal shed without invalidating the guarantee. Spend some time getting the base right! Do not attempt to construct your metal shed on a windy day as the metal sheets simply become sails in the wind and you risk denting some of these panels and worse, as you risk damaging yourself or others around you. Always wear gloves and suitable clothing making sure you have ample time on your side and ideally some assistance. Checking the parts list is important to make sure nothing is missing and you may have to do this in advance if you cannot install your shed soon after receiving it. In simple terms, you construct a metal frame in much the same way as you would construct a tent frame. Onto this frame you attach the metal cladding. Once you understand the principle one panel simply follows another, the gable ends and roof will obviously have different size panels, and these may include roof lights and air vents and other accessories depending on exactly what you have specified. In my opinion, you should not overtighten the screws initially as it leaves a little bit of 'play' in the shape of the shed to allow you to fit all panels correctly. You can fully tighten up at the end and this will also help pull the whole shed into shape. Once the shed is constructed bolting it to its prepared base is like adding the sixth side to a dice as it gives the whole structure the rigidity you would expect. Adding a clear waterproof sealant between the shed and base, on the inside and outside will stop any excess rain tracking back into the shed. This may, or may not be important depending on what you are storing. Some metal sheds offer a base frame as an option which usually consists of a metal square sectioned frame with cross members so it forms a 'noughts and crosses' structure. This can be filled with concrete or planked over to give a wooden internal floor if desired. 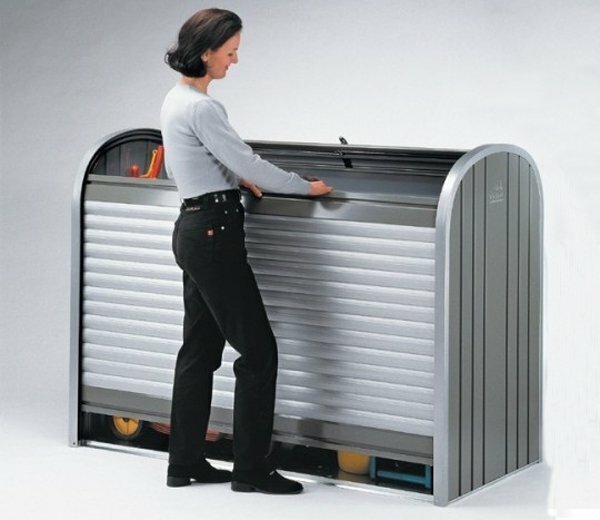 Which Metal Shed Should I Buy? Metal sheds are available in different qualities and sizes and depending on exactly what you want to use the shed for, is also aligned to your budget and available space. That might sound obvious but it is all too easy to confuse your exact needs and end up with a building that seems to cover most options but ends up as being only adequate for your real needs. If you have a caravan or mobile home in a trailer park you will probably want to store some basic garden tools, maybe an outdoor folding chair or two and the odd canister of gas for the barbecue. In this instance, the light clad storage boxes or small pent sheds that are available will be the right price and the right size. Convenience will possibly be more important than security as the value of the contents is unlikely to be a lot more than the cost of the shed. Invest in a good padlock and walk away knowing that you haven't shelled out the crown jewels to protect that rusty old spade and fork wedged behind the half bottle of gas that will last a few more BBQ's yet. If I'm wrong here there are more upmarket storage boxes that do have better security levels: some people may have very expensive bicycles that demand this, for example. If so I recommend you check out the Trimetals Bicycle Store. We even have an instance of the postal service in one of our Channel Isles needing a very secure, well engineered, but relatively small storage facility where post could be left for distribution later in the day. They trialled the Biohort StoreMax 120 and eventually purchased a quantity of these which I presume are still doing sterling service for them on a daily basis. In the garden the array of small and medium sized metal sheds becomes the most confusing. If you are looking for storage space then the apex roofed sheds are for you. You walk in down the centre at the highest point and traditionally store your goods to the left and right. This may be directly onto the ground or on shelving or racking that you can buy with the sheds or add separately. The pent style sheds, with a sloping roof from the high point at the front, are more traditionally used for working in as there is plenty of height at the front and you can put a work bench there and a storage bench at the back where it's lower. Pent style sheds also sit nicely against a wall and maximise the usable space in an area that may otherwise be redundant. They can also be good for storing taller items in some instances too. If security is an issue then look at some of the heavyweights to give you added peace of mind. Last close season a Premier League football team purchased a Biohort AvantGarde from us. Presumably, they needed to store something expensive in there and one of the wags that works with me suggested that might be football boots? I presume we will never know that but they are looking to purchase another one this summer so I guess they couldn't afford to buy two last year...... or maybe they simply had a budget like most of us do! On most metal shed ranges the strength of the cladding tends to be the same whether the shed is 6ft or 12ft long. This isn't an issue as the frame will be designed to take the total weight but it does mean that you can get some very good value for money large sheds like the Yardmaster GEYZ metal sheds or you can pay quite a lot more money for a shed that is designed and manufactured to be large from the outset and has ample capacity built into it right from the blueprint. It's at this end of the market that style and quality really stand out and nowhere better than the Austrian Biohort Europa metal shed. 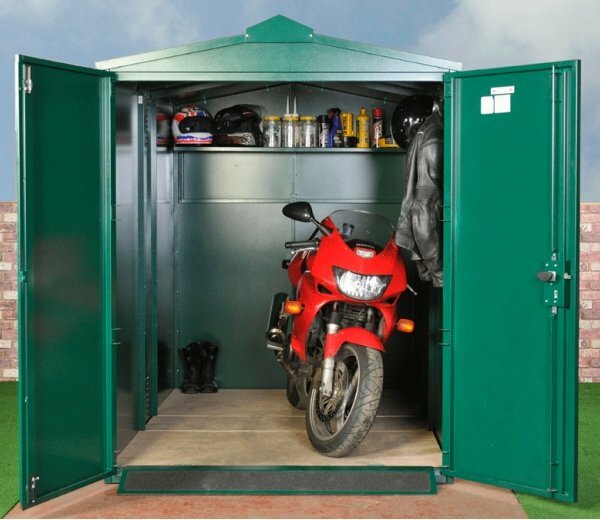 If you need to store a motorbike (or two) a mobility scooter or a ride on mower you will be looking for a good quality shed for both security and to satisfy the insurance company. Wide double doors will also be essential and easy access in and out of the unit will also be important. The metal shed market is well aware of this demand for wheeled entry and exit and there is a choice where you can spend your hard earned cash. The Trimetals Motorcycle Garage and the Asgard Motorbike Secure Garage have always been firm favourites of ours customers. Maybe your property is very contemporary from the outside but still traditional enough on the inside to feature a log burning wood stove? If so the Biohort Woodstock 150 Wood Store is not only aptly named but will suit your needs down to the ground. It is both very stylish and practical as well as being elegantly simple. Domestic metal shed design isn't restricted by size at all in fact and there is an impressive range of metal garages available that will easily swallow a car. The Yardmaster Metal Garage is only available in one size and one colour but what you lose in flexibility is more than made up by what you gain in price. It really is impressive and I do wonder how many people simply buy this garage as an overgrown metal shed and never put a car in it at all, or ever intend too. I do understand that the new Lotus metal garage is in the wings and should be available to the UK market soon. I expect it to be a great value no nonsense garage but it should be available in a range of sizes too. Metal sheds won't warp or swell, they are maintenance free with no preservative or roofing required, and won't be damaged by insects or other pests - these qualities immediately save you time and money. Q. Do metal sheds suffer from condensation? A. They can do if bases are not constructed properly, a damp base will almost certainly cause a condensation cycle. Ensure that the concrete or slab base is of the correct size i.e. only slightly larger than the shed base rail but large enough for you to drill into it without cracking away at the edges. The base should be ideally higher than the surrounding land area, and should contain a DPC layer within its construction (plastic sheet). Edges of the base should be trowelled smooth and slightly angled down towards the edge so that water seepage does not occur. Seal the inside of the base rail with a suitable waterproofing mastic. Q. Are metal sheds noisy in the rain? A. No more than a car parked outside the house. Q. Will metal sheds rust quickly? A. Pick a metal shed with good quality hot-dipped galvanized frame and panels, and a good paint coat and the shed will outlast the guarantee and be useful for many years without the need for maintenance. Q. Are thin gauge metal sheds strong enough to withstand gales? A. All the sheds for sale on GardenSite have been adequately tested and will withstand the majority of weather conditions experienced in this country. They will withstand similar loadings as a good quality wooden shed. Obviously, there are extremes of weather that no shed could withstand, but that is a normal insurable household risk. Q. Are metal sheds easy to build? A. The instructions in all the metal sheds offered here are comprehensive and descriptive. The task of building is straightforward and methodical, but it is a DIY product and requires a certain amount of DIY capability. There is no great science to the building of a metal shed, just a logical approach. Q. How long would it take two people to build say an 8x6 shed? A. 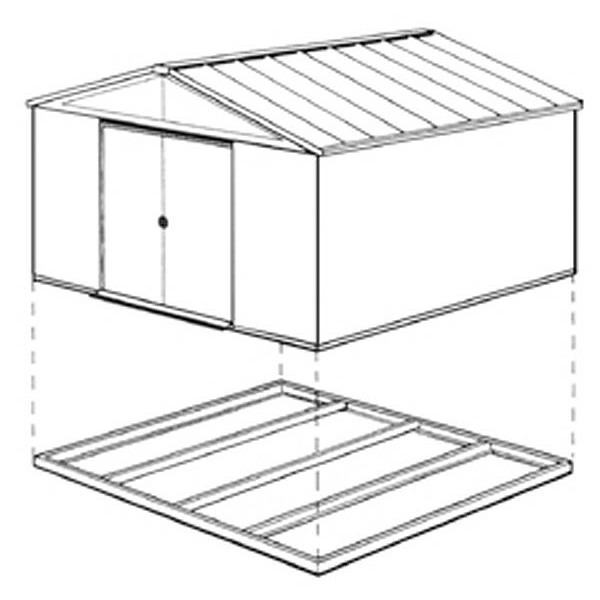 Two reasonably competent novices should be able to complete an 8x6 metal shed in about 4-6 hours. Q. How does the shed arrive, and can it be handled by one person? A. Most shed sizes arrive in one carton. Larger 10ft fronted sheds may be in 3 or 4 boxes. Our drivers handle the boxes easily on their own, however they will always place the unit safely for you, so that you can just open the box and commence building your shed. Q. How long will it take to deliver my shed if I choose to order? A. We always endeavour to deliver within 21 working days, if your chosen shed is in stock, it could well be sooner. We will always contact you the week before it is due to arrange a suitable delivery day, and an AM or PM slot. The Yardmaster brand is one of the oldest and best established in the UK market with over 30 years of trading behind them. They are an ISO 9001 accredited company which means quality and development are always at the forefront of the brand. They manufacture their sheds in their own purpose built factory in Draperstown, Northern Ireland and have warehouses around the UK so will always have the shed you want in stock for speedy delivery. They offer great after sales service and a guarantee that any undamaged panel showing signs of rust will be replaced FOC for up to 12 years after purchase. Yardmaster offer a large range of metal sheds with impressive specifications, some offer skylights for a bright interior, others have guttering and security is emphasized with anti-tamper bolts. All are braced for strength and feature high gables, excellent ventilation and thick panels with seven layers of protection, that's why they are always a very popular choice. View all YardMaster metal sheds. Trimetals is still a family run business by the Smiths based on the south coast near Bournemouth. Designed and built in-house gives the range an Englishness that is personified by their Titan range. Strong, sturdy, angular no-nonsense sheds that are often specified by architects and designers mark them out as unique. Trimetals also develop niches in the market as can be seen by their large range of storage units including gas stores and under caravan stores amongst others. They gained a Queen’s Award for Enterprise in 2016 and they manufacture the only metal sheds and storage boxes endorsed by the RHS. Rowlinson metal sheds are another ISO 9001 accredited family run company that has been trading since 1926. Timber is the core element of the company but under the stewardship of Jimmy Rowlinson they have diversified over recent years and now offer a very competitive range of metal sheds and stores. The timber effect Woodvale metal shed is popular as it combines a sympathetic natural appearance allied to a very competitive price. View all Rowlinson metal sheds. Asgard Secure Steel Storage has been supplying steel storage systems in the UK for almost 40 years. They are one of only six GPS (Government Procurement Services) appointed companies within the UK. They are also an ISO 14001 accredited company who are vastly experienced in producing heavy duty metal storage solutions. 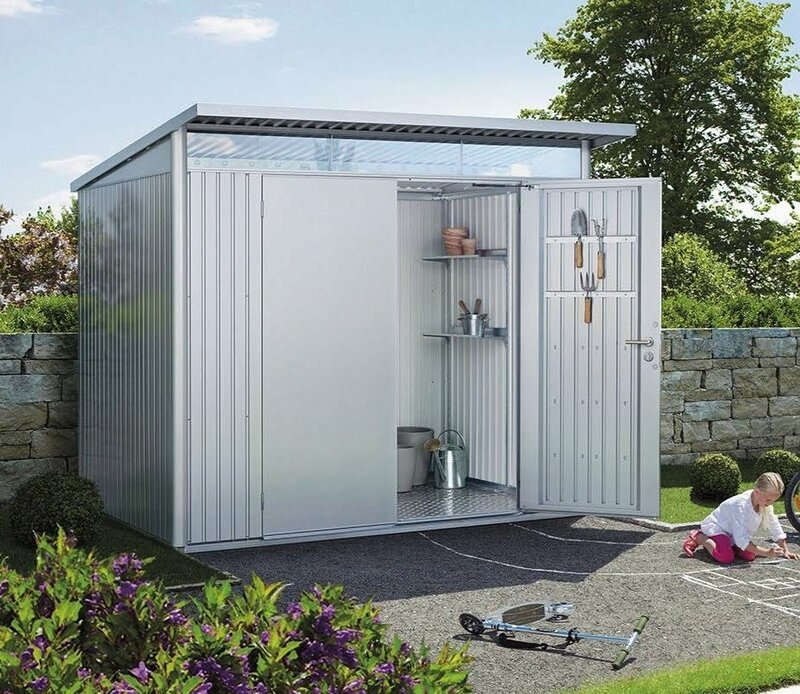 They firmly believe that with weight comes security and their prolonged success in this area is a testament to the very many satisfied customers who buy their sheds, motorbike garages and garden storage units. We have already published an in-depth review of Asgard metal sheds in The Gardener that goes into a lot more depth about the individual products manufactured. View all Asgard metal sheds. The attention to detail that surrounds the Biohort range of metal sheds is second to none. Even the name has been carefully chosen from the Greek ‘bios’ for ‘life’ and the Latin ‘hortus’ for ‘the garden’. Combine the two and ‘Life In The Garden’ is exactly what Biohort stands for. And that should be enhanced to ‘organised life in the garden’ as that is exactly what you get with these sheds. Every detail has been thought through and the product has benefitted from in-depth research and development. German engineering at its best, except these units come from Austria, and they won’t thank me for that confusion. The Europa is the main product of the range, offering a very functional and usable space in the garden that is a pleasure to use. View all Biohort metal sheds. The StoreMax garden and bike stores are brilliantly engineered so the closure rolls up at the touch of a finger. If you want the very best in engineering, design and style seek out the AvantGarde. The larger Biohort units are delivered directly from Austria so you can wait up to 6 weeks in high season and the prices are not for the faint-hearted but with Biohort you get what you pay for - no question. View all Storemore metal sheds. I have already reviewed the Lotus Metal Shed range in depth here, and will simply add that the range has been so successful that it has been expanded dramatically as sales have risen. New colours and sizes have been added and customer satisfaction is very high. View all Lotus metal sheds. This list is not exhaustive and there are other manufacturers and importers that offer great quality and value for money in this very competitive market so don’t be afraid to search around. We obviously cannot tell you which metal shed you should buy but hopefully, you will have a much clearer picture now of the options available and which one will suit both your needs and your budget. Those are, without doubt, the two most important considerations. After sales service, availability of spares or replacement parts and delivery lead times also have to be considered. Study your options at least twice and then choose once and choose right. This is a well made shed/garage, I've only one bike so that fits in easily and there's enough room for all my tools so I can tinker with it. Inside is ventilated so that helps and both the base and sides seem strong, no windows and a good locking mechanism mean that security is pretty good as well. Obviously very strong and with good security, this shed does a great job keeping my cycles safe and sound, much more secure than a timber shed from which I've had belongings stolen in the past.